DiamanteDesk supports 4 possible options of contacting a service Help Desk team in order to create a new ticket and make a request or report an issue. Any user can do it through a Portal or Embedded Form, over the phone call or by sending an email to the support address. All the emails that get to the support email address are automatically retrieved by the DiamanteDesk system in order to create a separate ticket out of each received letter. To make sure that all customer requests sent to the service support email are automatically converted into tickets by the system, the email processing feature shall be configured at System > Configuration. 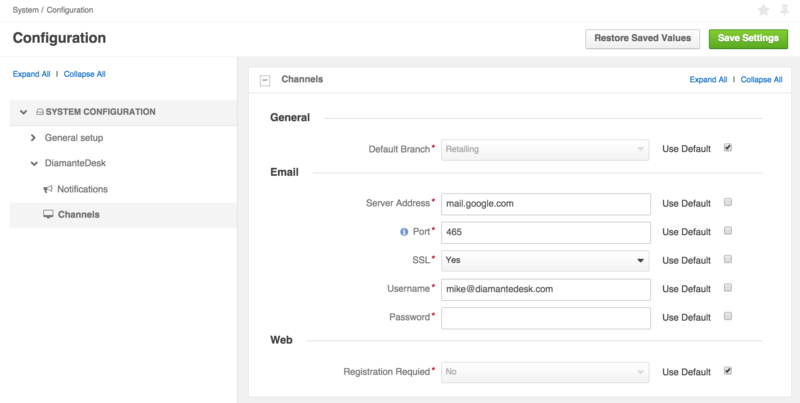 To configure email processing functionality, go to System > Configuration. 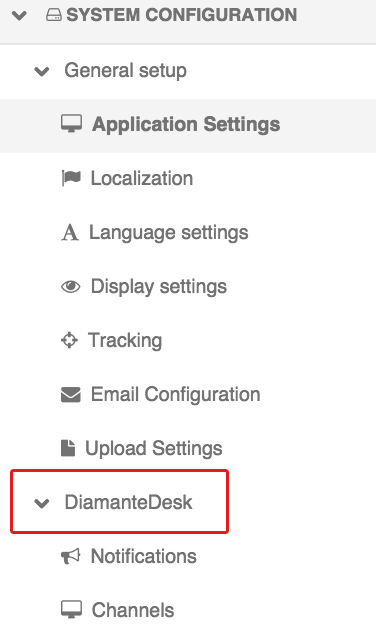 On the System Configuaration pane select the DiamanteDesk menu and Channels tab. Note: All the fields in the Channels tab are required fields but each of them has specific default settings. To use the default settings, select the Use Default check box in the corresponding field. To edit the configurations, clear the the Use Default check box in the corresponding field and specify the necessary value. In the General section select a default branch for email processing. All the newly created tickets will automatically get to the specified branch and later they can be reassigned to any other branch of your choice. To set a default branch, make sure that the Use Default check box is clear, click the down arrow in the Default branch field and select the required branch from the drop-down list. Port. Provide the port number. Hint: It is typically on port 143. But IMAP over SSL is usually on port 993. Password. Provide the password from a support email account.